Junella J. “June” Coolman, age 87, of Ney, Ohio, died at 2:25 A.M. on Friday, March 22, 2019, at Laurels of Defiance, surrounded by her loving family, after a full active and rewarding life. Early in her work career she was a nanny in Toledo, Ohio, worked at the 50 Corporation in Bryan, Ohio, cleaned homes in the Bryan area and later was a food demonstrator, was a jewelry and greeting card merchandiser, and operated a country store from her garage while a stay-at-home mom. Affectionately known as the “Egg Lady” or “Chicken Lady,” Mrs. Coolman was active as a 4-H advisor for many years, was a poultry supervisor at the Defiance County Fair for twenty years, and was on the Supervisory Committee at Christo Rey Federal Credit Union for fifty years. June was a 1949 graduate of Defiance High School and attended Bowling Green State University. She was a registered member of St. Isidore Catholic Church (Marysdale), where she was a member of the Rosary Altar Society, and attended St. Patrick Catholic Church in Bryan, where she was active in St. Anne’s Circle. She enjoyed traveling to the casino to gamble and attending her grandchildren and great-grandchildren’s events. 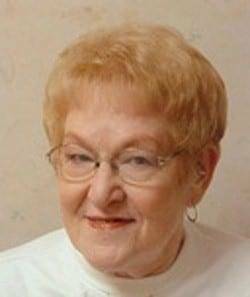 Born on May 13, 1931, in Defiance County, June was the daughter of Bernard and Lillian (Grine) Hesselschwardt. She married Gilbert A. “Gil” Coolman on August 16, 1958, at Marysdale and he preceded her in death on October 11, 2012. Survivors include her children, Cindy (Mike) Siler, of Ney, Steven (Barbara) Coolman, of Defiance, Ohio, Suzy (Jim) Kline, of Hicksville, Ohio, and Diane Johns, of Sherwood, Ohio; ten grandchildren; twenty great-grandchildren; two sisters, Ila Jean Lutz, of Edon, Ohio, and Monica (Robert) Hearne, of Defiance; and one brother, Edgar (Mary Slattery) Hesselschwardt, of Hicksville. She was preceded in death by her parents; a daughter, Patsy Coolman; two brothers, Marvin and Hubert Hesselschwardt; and a son-in-law, Sandy Johns. A Mass of Christian Burial was celebrated on Tuesday, March 26, 2019, at St. Isidore Catholic Church (Marysdale) with Father Robert Kill officiating. Interment in St. Isidore Catholic Cemetery (Marysdale) will take place at a later date. Memorial donations are requested to Heartland Hospice, Laurels of Defiance, St. Isidore Catholic Church, St. Patrick Catholic Church or an organization of the donor’s choice. Be the first to comment on "Junella “June” Coolman (1931-2019)"